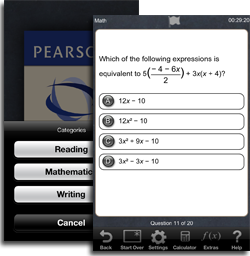 This app consists of 60 multiple choice questions (20 per subtest) with correct response explanations. The questions are general, and will aid users in preparing for any teacher preparation examination of basic skills, but Indiana candidates should note that the app has been modeled on items developed for the Core Academic Skills Assessment. The questions can be answered timed or untimed, with results reported as the number correct by skill or objective. Also included is a diagnostic answer key option. Test results will be stored so candidates can answer the questions again after further study, if desired.